For most people, the natural world is intuitively divided into recognizable, bounded units of landscape with characteristic climates and land cover, such as deserts and rainforests. These ideas form the basis of our concept of ecosystems1. This is where the ocean poses a unique challenge. To the eye of the non-sailor, the surface of nearly three quarters of the planet is largely uniform, with small variations in the color and choppiness of the sea. Marine ecologists and oceanographers have spent decades on a precise answer to this question: is the ocean a biological continuum or are there distinct ecological units?2 Nereus researchers are delving deep into this question, exploring how climate-change will change the answer and untangling what it will all mean for the ocean resources humans rely on across the globe. Organizing nature into distinct categories based on flora, fauna and landscape traces back to 320 B.C. and the ancient text “Enquiry into Plants”, a foundational piece of natural history by Theophrastus. At a global-scale, ecosystems on land naturally organize into major units like boreal forest, savannah, desert, tundra and grasslands (Fig. 1). For all intents and purposes, these ecosystems are autonomous; their inner-workings are nearly independent from interactions with the others3. 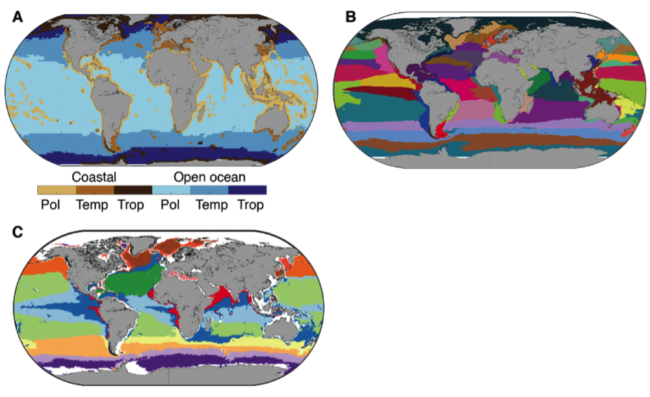 Based on the way different species and marine environments are distributed across the globe, scientists quickly concluded that the ocean was indeed composed invisible frontiers that draw the lines between marine macro-ecosystems. To prove the existence these ecosystems, the scientific community has relied on biogeography, which aims to understand the spatial distributions of organisms across time and to disentangle the patterns of how nature varies across the geographic/environmental gradients of area, isolation, latitude, depth, and elevation. The ocean is an immense, three dimensional and dynamic entity. The sheer magnitude of the sea and the prohibitive cost of exploring it exhaustively has for a long time prevented marine biogeographers from dividing the global ocean into discrete ecosystems. But that’s not to say it hasn’t been attempted. Mary Sommerville, a science writer and one of the first female members of the Royal Astronomical Society, proposed the first division of the global oceans in 1872. Based on the primitive physical and chemical knowledge available to her at the time, Sommerville’s idea was to separate cold and warm water regions by creating “homozoic zones”. These zones were later roughly matched up to the landing locations of the various fish species caught in the North Atlantic. Sommerville’s attempt showed that the ocean was indeed composed by biological and environmental gradients that could be separated by objective frontiers. In the years that followed, growing numbers of oceanographic missions and international collaborations led to a multitude of proposed ocean divisions. These systems of categorization are based on species distribution4 or environmental conditions5. The biggest game changer in the field of marine biogeography was the launch of satellites during the late 70s. Satellite technology revolutionized the field by allowing full observation of variables that influence marine species distributions such as wind, temperature, sea ice, ocean color and more. Due to the low cost of remote sensing compared to field sampling, marine biogeography has flourished for the last 20 years. 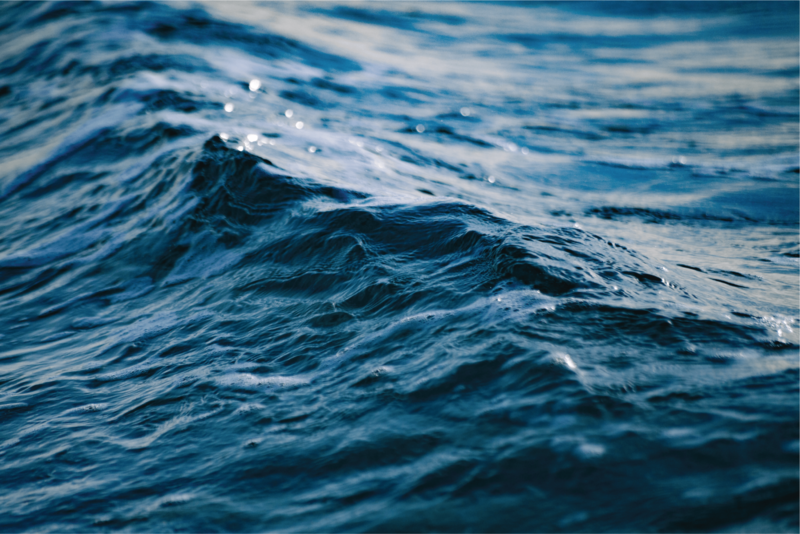 Scientists have been able to identify various climatic regions of the ocean by studying the remotely sensed physical and chemical parameters that influence primary producer growth6. from the color of the ocean in observed by satellites. 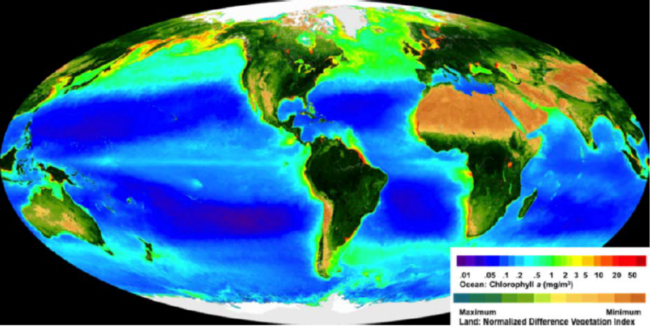 Combining that information with a series of chemical and physical variables influencing phytoplankton biomass, they defined four global biomes: coastal, tropical, temperate and polar. Those biomes were then sub-divided into 56 biogeochemical provinces based on unique regional features. In recent years, studies of the marine organism distribution from phytoplankton to top predators have confirmed the provinces that Longhurst defined; to put it simply, changes in marine plant and animal distributions matched changes in province, which showing that Longhurst’s model worked. Figure 2. Map of the original division proposed by Longhurst (1998) for Ocean biomes (A) and biogeochemical provinces (B). Despite the initial success of Longhurst’s original division, it didn’t fully capture the all of the ocean’s complexity. The ocean isn’t a static entity – changing seasons, shifting currents, temperature fluctuations and extreme events can all impact the distribution of the invisible borders between ocean provinces and biomes. That’s why Nereus researcher Gabriel Reygondeau developed a new approach to capture the shifting frontiers. By numerically accounting for dynamic ocean processes using monthly observation of salinity, temperature, chlorophyll-an and others environmental parameters, he and his colleagues were able to provide a real time picture of the distribution of the provinces and biomes of the global ocean (Figure 3A and B). The approach was also extended to the deep ocean (the mesopelagic layer, found at 200 to 1000 meters), to account for the three-dimensionality of the ocean (Fig 3C). This new approach revealed interactions that could change the spatial distributions of marine ecosystems seasonally or during extreme events such as El Niño. The observed province distribution shifts were mirrored by shifting distributions of exploited marine species, such as tuna and some billfish. This provides additional argument for the crucial role of climate and ecosystem stability for sustainable management of marine resources. To go a step further, Reygondeau and his colleagues divided some provinces into regional units named “biogeochemical regions”. The intent was to provide an ecological division that would work well for management purposes, such as the implementation of marine protected areas or the evaluation of regional exploited stock. 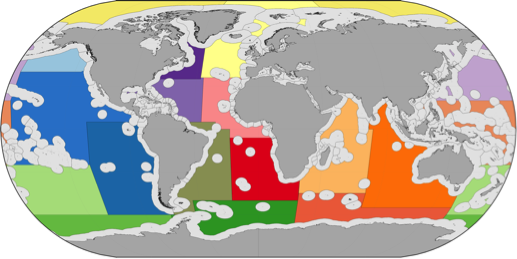 The dynamic provinces proposed by Reygondeau can be used to consider how climate-driven environmental changes will impact the availability of marine resources for human use. These provinces have the huge advantage of real-time, ecologically reliable borders, which is a big step up from the rigid legal divisions like Exclusive Economic Zones or those proposed by FAO (Fig. 4). Figure 4. Exclusive Economical Zone (EEZ in grey) or Food And Agriculture division (in color). Reygondeau, G., Longhurst, A., Beaugrand, G., Martinez, E., Antoine, D., & Maury, O. (2013) Toward Dynamic Biogeochemical Provinces. Global Biogeochemical Cycle. 27. 1046-1058.